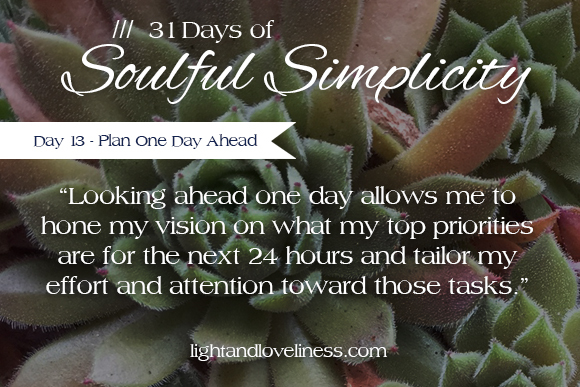 This is day 13 of Soulful Simplicity, a 31-day series through the month of October. The first week of the series can be found here. I hope you are enriched by this series. If you have any questions or would otherwise like to connect, feel free to send me a note: lightandloveliness [at] gmail [dot] com. I wasn’t always a plan-ahead type. I have a bit of a creative streak, and gravitate toward spontaneous and unscripted, but over time I have realized that flying-by-the-seat-of-my-pants is much harder to do with a bunch of kids. Each has their own personality and way of doing things, and even if I rally to get them moving in the same direction, there is always a risk that one or more of them will choose a critical moment to make it extra challenging to get things done. Having kids in the mix requires extra effort and extra patience to stay focused. I’ve learned our days at home are only going to be as smooth as I have the vision for. 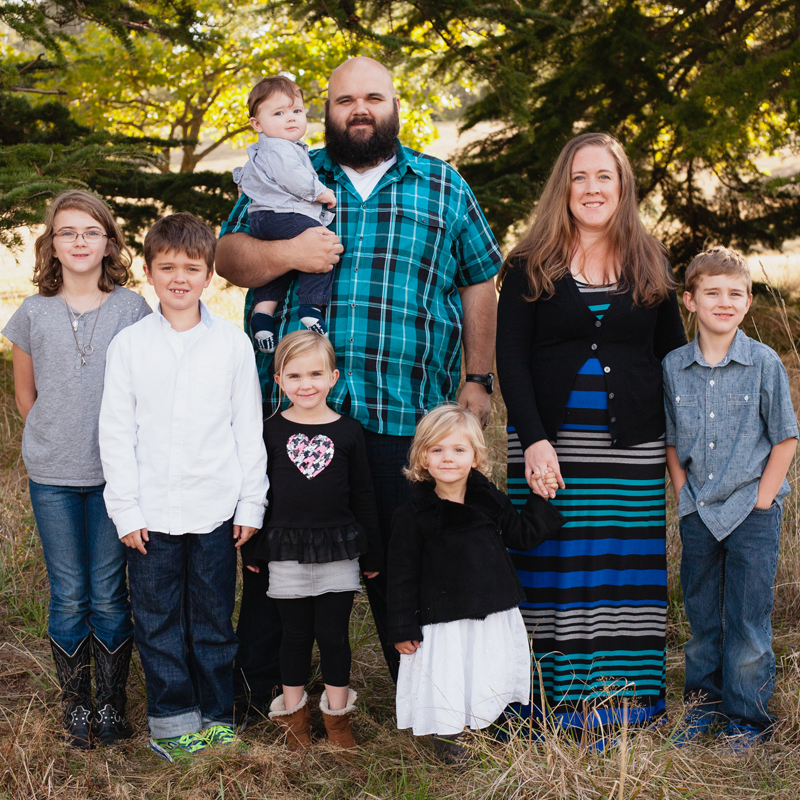 I now have six children whose attention and motivation are my responsibility to capture and steward well, which is no small task. If I have no plan for the day, and I have given no thought to how I will begin the morning, what I will be engaging for the day, and the small details I will need to remember on a list where I can remind my tired mom brain what in the world needs to be done, I can almost guarantee you all of us will struggle through the entire day. If I do have a plan, the day often goes much smoother. Having a vision for the day doesn’t necessarily mean everything will go well, but it does give me the best shot at a day that accomplishes some or all of what needs to be done, and with minimal disruption to the family peace. I know the idea of having a plan for the day is nothing novel, but despite its simplicity, it is something I now do every day because it helps me that much. Looking ahead one day allows me to hone my vision on what my top priorities are for the next 24 hours, tailoring my effort and attention toward those tasks. To plan one day ahead, I find a moment in my day (usually evening for me) to sit and jot down a list of what is coming at me in the next 24-48 hours. What errands need to be run? What appointments do I need to make or show up at? What is our meal situation? Who do I need to connect with by email or phone? What are the top priorities around the house? How can I group or combine or delegate tasks effectively? These are all questions whose answers end up on my list. The list allows me to complete everything in an efficient manner so I don’t expend any more energy than necessary, and all the high-priority items are addressed. I put anything and everything that requires my attention so that when I look back on my week, I can see on paper what progress I’ve made. Going back to the list to remember the small things I’ve done helps me to remember what even happened in that blur of days and helps me celebrate my small victories. I personally keep these lists along with doodles and random writing in a moleskine journal, which I’ve now been doing for at least 8 years. The rules of my journal: no tearing out pages, no stressing about neat writing or anything looking a certain way…just fill those pages with the bits of life that are pertinent to me or happen to be on my mind at that time. I sometimes jot down writing prompts and ideas. I write out lists of goals or things I want to accomplish for the week, but mostly, it is something I return to every few days to make my “Plan One Day Ahead” list. My version is not terribly fancy, but it is along the same lines of this new term I’ve been hearing around called bullet journaling (the is new to me, but the process is not). Avid bullet journalers seem to have an affinity for fun colors, nicely designed journal pages and fancy writing, but I opt for anything-goes largely so I don’t waste a bunch of time trying to make a “pretty” list. For me, its all about function. If you search around for bullet journaling, you will find a number of great resources that explain the method, and you might find you benefit from having a pen-and-paper thought organizer for yourself. If you feel like you struggle to keep your focus through the day or you end the day feeling frustrated about what you didn’t get done, this idea might help you clarify your vision and keep your energy that otherwise might be lost going toward tasks that help you get ahead. Do you have a method that helps you keep your focus? I’d love to hear about it. I am shocked at how similar this is to my methods. I make todo lists first thing in the morning, kind of grouping them into 3 columns: me/writing, ministry stuff, kid/house. Planning further ahead stresses me out. I like taking it one day at a time too. Thanks for stopping in Jennifer! I’m glad to know the method works for you as well!